So many picture books now have a message that is for children of all ages, from 0 to 99. 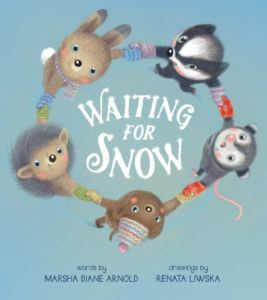 If you have ever waited, for snow, for a Christmas present, for a dream to come true, this picture book, written by Marsha Dian Arnold and Illustrated by Renata Liwska, will resonate with you. In the beginning, Hedgehog finds Badger staring at the sky. "What are you doing?" asked Hedgehog. "Waiting for snow," answers Badger. And so begins the oft repeated ritual of waiting for something that we really, really want. Let's try banging on pots and pans or throwing pebbles at the sky. How about a snow dance or, if all else fails, make it happen yourself even if it is not quite the real thing. Badger's journey is all of us. It is a journey of frustration followed by understanding that everything happens in its own time. Time, God, love, miracles, can't be forced. Sometimes there is nothing to do but wait. And waiting doesn't have to be a negative experience. Badger finds lots of fun ways to pass the time with his friends. Did Badger get his snow? Did his dream come true? Read Waiting for Snow and see what happens when Badger stops waiting and starts living in the moment.